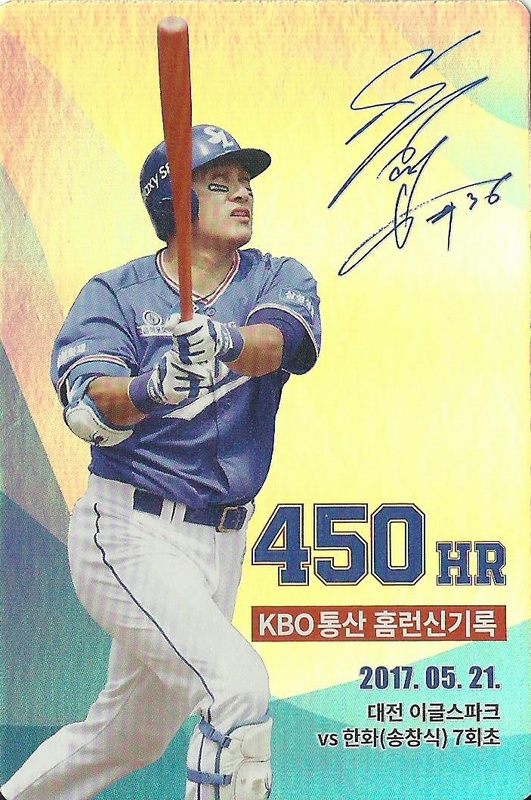 Since Lee Seung-yuop will be retiring after the season, the Samsung Lions issued a set of five cards commemorating his 5 best home runs. Each card is being given away on a specific date leading up to his final game on October 3, 2017. The five cards precede his final game. These cards are unnumbered but do have a red stamped number on the back which is for a prize giveaway during each of these games for three various prizes: Lee Seung-yuop bobblehead, Lee Seung-yuop Spyder brand cleats and a commemorative Lee Seung-Yuop Wilson glove. 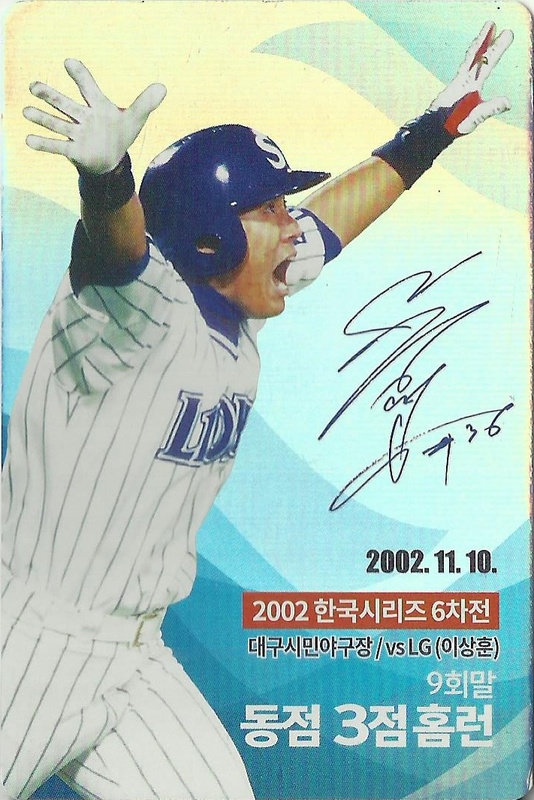 In the 2002 Korean series, the Samsung Lions were facing the SK Wyverns in Game 6 and leading the series 3-2. Trailing 9-6 in the bottom of the 9th, Lee Seung-yuop hits a 3-run home run to tie the game. 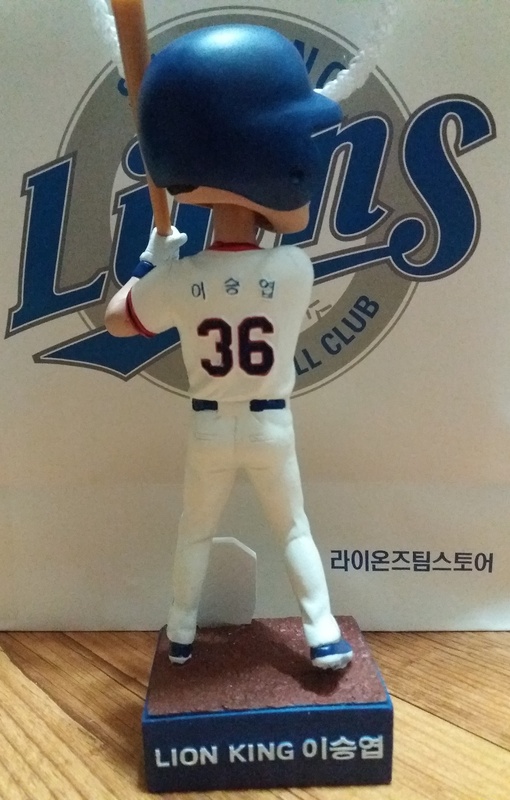 The next batter, Ma Hae-Young would hit a solo homer to win the championship. 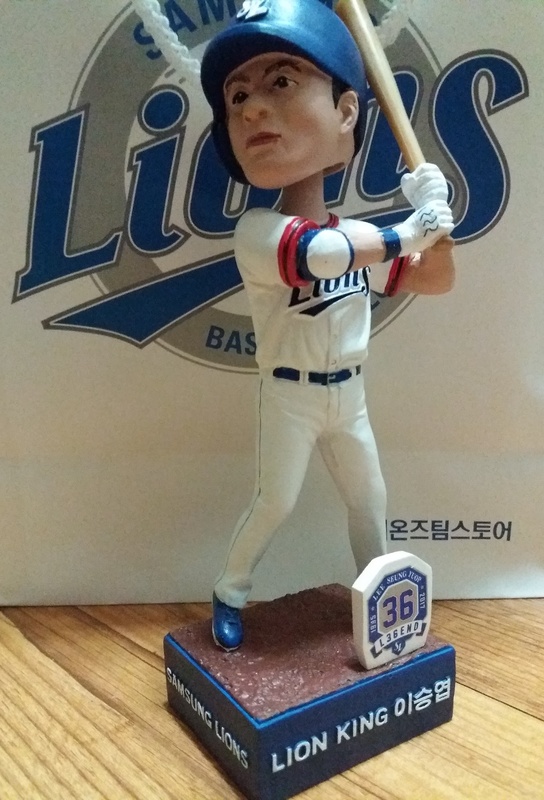 Lee would clobber 56 home runs in 2004 (also hit 54 in '99) breaking the Asian single-season record previously held by three NPB players, Sadaharu Oh ('64), Tuffy Rhodes ('01) and Alex Cabrera ('02). He would hit .323 and knock in 123 RBIs that year. In 2013, the record would be broken by Wladimir Balentien of the NPB who hit 60 homers. Per Wikipedia, in 2013 the NPB had introduced livelier "juiced" baseballs that later forced three-term commissioner Ryozo Kato to resign. Trailing Japan 2-1 in the 8th inning of the first round match up in the 2008 WBC, Lee Seung Yeop comes to bat with a runner on and hits a 2-run HR off Japan's Hirotoshi Ishii who left an off-speed pitch up. They would beat Japan again in the second round but were forced to play them a third time and lose to them in the Semi-Finals. Lee would be named to the All-WBC team. 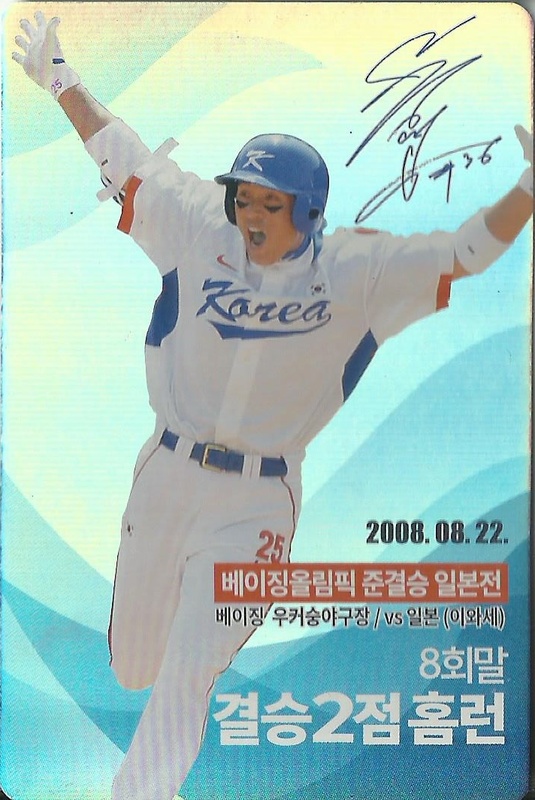 In the 2008 Beijing Olympics semi-final game, Japan and Korea were tied in the 8th 2-2 when Lee Seung-Yeop came to bat with Lee Yong-Kyu on first. He proceeds to hit a 2 HR to put Korea ahead for good. Korea would go on to win that game 6-2 and then beat Cuba in the finals by a score of 3-2, giving them the gold medal. 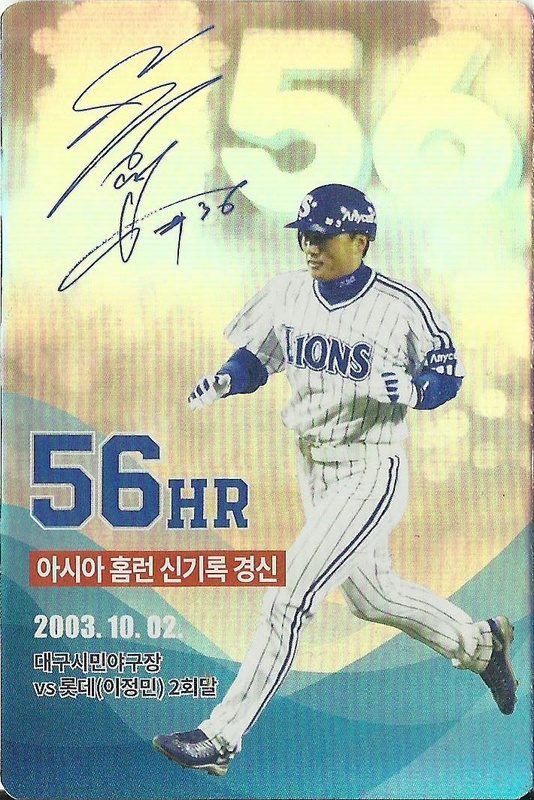 In the 7th inning of a game against the Hanwha Eagles, Lee hit his 450th home run off reliever Song Chang-sik. Lee has hit at least 20 HRs in 12 of his 15 KBO seasons. He currently sits at 465 HR with three games remaining before retiring. I have uploaded that checklist and images here: TCDB. I've been exchanging emails with the printer and they said everything looks good and I made payment. WE ARE A GO! The price is a little cheaper than originally thought. The sets will be numbered to 20 and handwritten in pen. Now the pricing below includes the (1) set print cost, (2) shipping to my friend, (3) cost of 50 card plastic case, and (4) shipping to you. All of you pay the same for #1 #2 #3, outside of U.S. pays more for #4. For those of you in Korea: $33 shipped (PayPal gift please) but bank transfer is acceptable too at W37,000) This includes double shipping to me then to you to make it easier for my friend. As payments are confirmed, I will update the list below with "paid" next to your initials. Currently there are 6 sets available from the 20. I am in the process of designing the 2017 set with an 80s vibe. I have to wait until the regular season is over so I can use the stats for the back of the cards. I think this next 2017 set should run about the same price, maybe cheaper. Thanks for everyone's interest in the set and giving me more inspiration.